Hair toppers go by many names thanks to the wide array of options available to disguise partial hair loss. Wiglet, hairpiece and hair enhancer are all interchangeable terms for hair toppers. Many times, toppers will be called “wiglets” because they look like miniature versions of wigs. Different toppers use various methods of attachment to clip in to your existing hair and cover areas of hair loss. Some offer more converge than others, but all are designed to seamlessly blend with your own hair when applied correctly. Our comprehensive guide below will discuss the different types of toppers, how to select the right topper style, how to use a topper, and much more. Designed to conceal hair loss at various stages and different areas of the scalp, hair toppers come in many shapes and sizes. Some offer more coverage on the top, while others aim to cover the sides or back of the head. Some are even specifically designed for the sole purpose of adding volume to thin or fine hair. One thing to keep in mind when shopping for a wiglet is that there is no one size fits all solution. Each hairpiece is meticulously designed to offer coverage where you need it and to blend in with your existing hair. 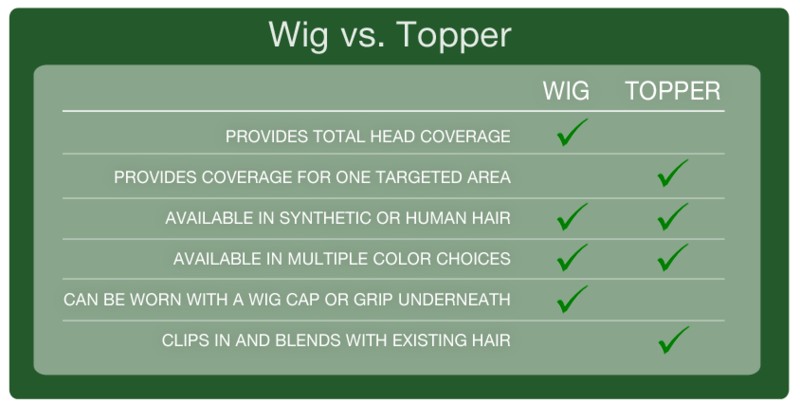 With toppers or wiglets, you are able to uniquely address your partial hair loss needs. Multiple hairpieces can be worn to cover more than one area, making them a great alternative to a full wig for women with thinning hair. When choosing a hair topper or wiglet, you will want to note the base style and size, the hair length, hair type and color. This will help determine which topper style is right for you. Toppers can add body to your hair as well as conceal patches of hair loss. Here are a few "before" and "after" photos. As you can see, hair toppers can significantly change your look as well as conceal thinning hair or balding patches seamlessly. Left: Clip in Hair Topper by Revlon. Right: Easi Part by Jon Renau. This hairpiece is ideal for covering a thinning part area. 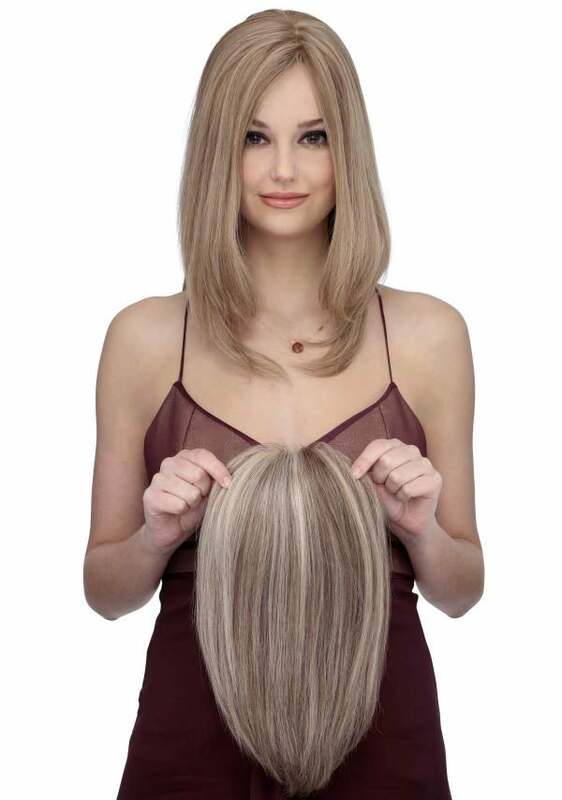 The easiPart comes in multiple sizes and lengths and is offered in either human hair or heat friendly synthetic hair. Who Needs a Hair Topper? Anyone with hair loss who wishes to cover up thinning areas or baldness on the scalp may desire a hair topper. This type of hair loss can occur as a result of aging, alopecia, certain medications (like chemo), stress, trichotillomania and many other conditions. If you feel that your hair is lacking volume, a topper can not only help disguise areas of hair loss, but add the look of fullness to your existing hair as well. Not everyone who wears a topper has hair loss. Some women wear toppers to balance out lengthy extensions by adding more hair to the top of the head with a hairpiece. It is easiest to begin shopping for a hair topper or wiglet by determining the type of hair loss that you are experiencing. The stages of hair loss can be classified by the amount of hair that you have lost. Hair loss begins in a diffused pattern at the top of the head resulting in minimal loss. Most women with this stage of hair loss will need a topper with a smaller base size or one with an interable base. This is the stage of hair loss where the scalp becomes noticeable through sparse areas of hair. A medium to large base is typically needed. With a soft measuring tape, record the measurements of the widest points from front to back and side to side across the area where you are experiencing hair loss. Record the measurements, adding one inch to each measurement to allow for a half an inch of hair on each side or end of the base for a clip to attach into your existing hair. If your measurements are larger than what you see available in our topper selection, try having a friend or family member take your measurements to double check your accuracy. If you are still finding your area of hair loss to be larger than the topper bases offered, you may consider shopping for a full wig. Now that you know your measurements, take note of where your hair loss is located. This will help in determining the type of base that you choose. This base is formed by attaching each individual hair to a soft mesh material. Because each hair is hand tied to the base, it gives the appearance of real hair growing from the scalp. This type of base features rows or wefts of hair. Often, your own hair can be pulled in between the wefts to integrate your own hair with the hairpiece. Just like wigs, hair toppers come in synthetic, human hair and heat friendly synthetic hair options. Because a topper is meant to blend in with your existing hair, many women prefer heat friendly synthetic or human hair toppers. These types of hair allow you to create texture with heated styling tools that closely resembles your own hair. Synthetic toppers are a great option as well. Synthetic toppers come in straight, wavy and curly textures to help you find just the right one to blend with your own hair. They are also very easy to maintain and offer a high quality look at an affordable price point. The length of the topper that you will want to choose will depend on the look that you are trying to achieve. Women with short hairstyles often desire wiglets that match the length of their style from root to end, while women with longer hairstyles can choose toppers that range in length from short to long depending on whether or not their hair is layered. A gorgeous topper can be a great way to add the look of layering to your existing style. You can choose to wear a topper with strands shorter than the length of your existing hair and have your stylist cut your hair to look like the topper is layered into the rest of your hair. You want your hairpiece to resemble your existing hair color as closely as possible, but keep in mind that there will not always be a perfect match for every shade. We highly recommend taking advantage of our free wig consultations with our certified wig specialist to help color match your topper to your existing hair. Sometimes, it is a good idea to find a topper shade that is as close to what you want your hair to look like as possible and then have your existing hair professionally dyed to match the topper. This can really give you a natural look. Once you have found your perfect hairpiece, you’re ready to clip it in and go! Open all clips on the underside of the topper. Place the front edge of the topper approximately 1-2 inches from the front of your hairline, positioning it over the area of hair loss, and secure the front clip. Place light pressure over the top of the hairpiece and run your fingers over the length of the base to secure the back clip(s). Keep the base pulled tight across the top as you secure any side clips.Style and blend hair as desired. PRO TIP: Lightly tease your hair in the areas where the topper clips will attach to get a more secure hold. The part of your hair refers to the area where your hair is divided to either side of your head. Many women part their hair on one side of their head, either left or right. Other women prefer their hair parted straight down the middle of the head. At the part, the skin of the scalp can be seen where the hairs separate to either side. Toppers that are meant to disguise a thinning part are often long and narrow and will cover the natural part to allow less scalp area to be seen. The top of the head is the area in the very center of the skull at the uppermost point and extends outward circularly. Wiglets that are meant to be worn at the top of the head can cover various circumferences depending on the area of hair loss.. The area at the top and back of the head where the skull begins to curve out and downward is called the crown. Toppers that are meant to cover the crown extend both horizontally and vertically to cover a rectangular area. This is the area where many women prefer to add volume to certain hairstyles with clip-in volumizers. We have prepared this handy Hair Topper Style Chart to help you select the right topper depending on hair type, coverage area and base size. These hairpieces offer coverage at the front of the hairline that can cover any unevenness in that area. They are also a great option for women who want to try wearing bangs without the commitment. Try modern blunt cut bangs or classic side swept fringe to change up your look. Extensions do not offer coverage, but rather work to add length or fullness by attaching into your existing hair without a base. Some extensions clip in as individual strips of hair with one clip to attach at the root of your hair, while others offer several clips across a strip of hair that covers a wider width side to side. This type of hairpiece does not cover areas of hair loss. Volumizers feature integrable bases that allow you to pull your hair through the wefting and blend the hairpiece seamlessly with your own hair to create fullness in a targeted area. Look for the hairpieces labeled "Volumizers" on our Hair Topper page.